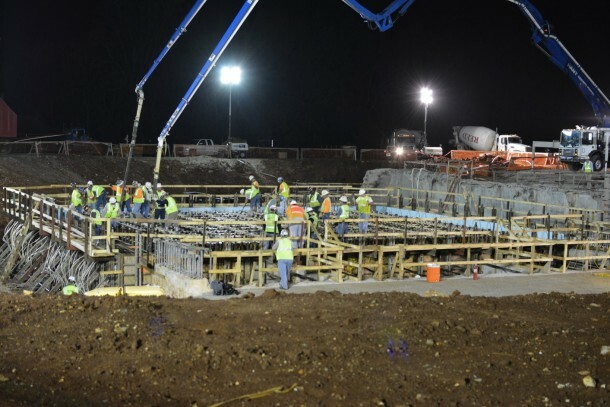 On Oct. 17, crews pour concrete and embed anchor rods to stabilize a new, 215-foot test stand at NASA’s Marshall Space Flight Center in Huntsville, Alabama. Test Stand 4693 will be used for structural loads testing on the liquid hydrogen tank for the core stage of NASA’s Space Launch System. The core stage, towering more than 200 feet tall, will store cryogenic liquid hydrogen and liquid oxygen that will feed the vehicle’s RS-25 engines. SLS will be the most powerful rocket ever built for deep space missions, including to an asteroid and ultimately Mars. The 4693 structure — being built on the foundation of the stand where the Saturn V F-1 engine was tested — will have a twin-tower configuration and be made with 2,150 tons of steel. The liquid hydrogen tank will be placed in the stand vertically, and be loaded with liquid nitrogen for stress testing. A second test stand also is under construction at the Marshall Center and will be used to test the liquid oxygen tank. The stands are on track to being completed in 2015.